March is here. We’re all excited for spring. We’re thinking about wearing green for St. Patrick’s Day. Green is everywhere! And I like it. And I also really like this shake. Okay, here’s the truth – I’ve never actually had a real Shamrock Shake from that fast food place (you know the one). But just looking at its unnatural shade of green I knew I could make a healthier version at home! I heard Cameron Diaz talking about her new book on Jimmy Fallon, and she said something to the effect of being against diets because they are about deprivation. Usually I’m firmly against taking dietary advice from a stick thin former model, but this time I happen to agree. Eating well is about nutrition. 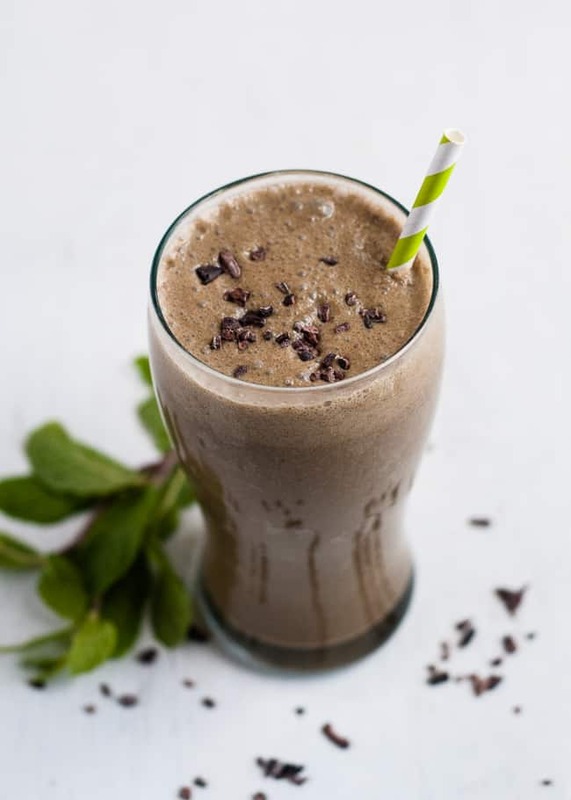 This shake is delicious and feels like a treat, but it’s 100% natural and healthy. It’s like having your cake and eating it too! 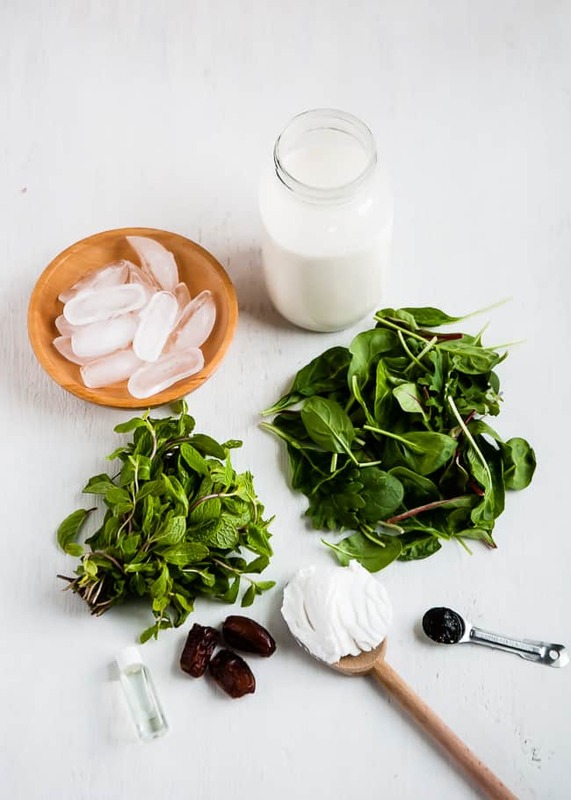 In this copycat shake you won’t find any dairy, processed ingredients, food coloring or sugars. You’ll find 100% all-natural ingredients and you don’t have to feel guilty as you sip it. I used a mix of organic baby super greens, but you can use baby spinach or whatever your favorite green is. The baby greens have a milder flavor if that’s an issue. I also included a handful of fresh mint and a few drops of pure peppermint oil for the extra refreshing minty flavor. To sweeten it, I used whole, pitted dates. If you wanted to, you could use a frozen ripe banana instead. It would also make the shake a little thicker. For the creamy element, I used coconut cream and homemade almond milk and a bit of vanilla bean paste. The ice is just to make it nice and cold. Instead of whipped cream and a cherry, I used roasted cacao nibs for a nutty, chocolatey crunch. This is such a yummy shake/smoothie. It’s fresh and healthy and a perfect replacement for the original. 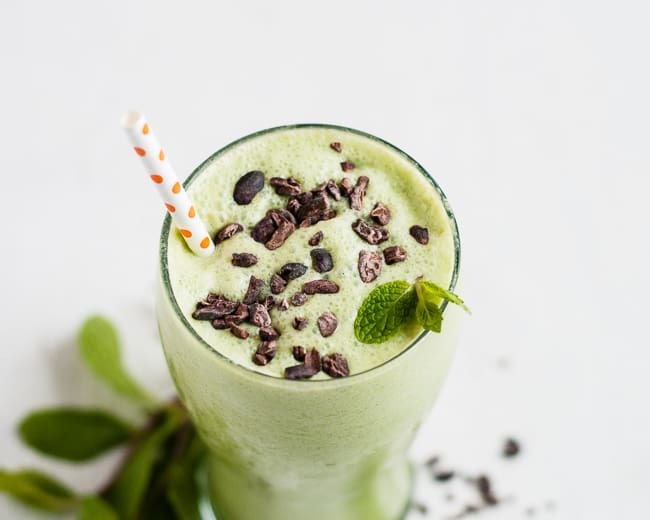 A healthy, nutrition-packed minty green shake. Place all ingredients into a blender and puree until smooth. Pour into a tall glass and enjoy. -If your dates aren't soft, be sure to soak them first in a little warm water. 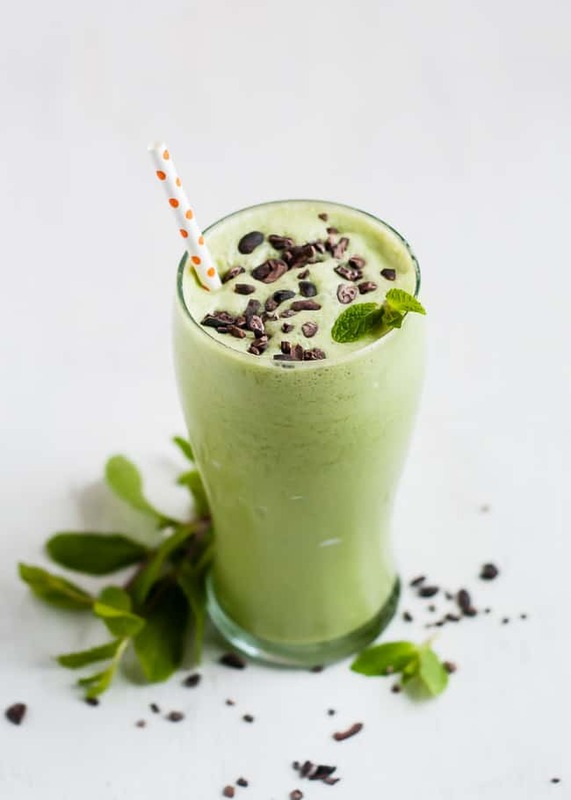 I’ve always loved mint in a smoothie!! Definitely have to try dates as a natural sweetener. Usually I use banana or honey! Hi – thanks for sharing this great recipe! I used avocado, unsweetened almond milk, raw honey and peppermint oil with baby spinach. Next time I’ll try the fresh mint leaves and dates. Green is my favourite colour and mint is always a favourite of mine! feels like I’m being naughty, but I’m not!! I can see myself making this for an afternoon refreshment when my energy levels start to diminish! Rather than reach for another cup of coffee, I’ll make this goodness. P.s. Your blog is absolutely beautiful too ! I used to obsess over the shamrock shake when I was a kid. I’m sure it’s 98 percent artificial everything. It’s absolutely horrible! Not worth it for me to even try one. This looks delicious! Where can I find coconut cream? I get mine at Trader Joe’s, Whole Foods, and my Asian market. You’ll find it near other coconut milk. If you can’t find the cream where you live, just use coconut milk. It will taste the same.